Fact is, we drop things, and if we have kids, we are all too familiar with finding all sorts of lost items under the fridge, oven, standing aircon, and all sorts of other places. Now, thanks to a simple, but effective solution, you never have to worry about finding a mess under your appliances. Introducing the Stuff Stopper! Get it from The Stuff Stopper here. As the name suggest, the Stuff Stopper is a device that stops stuff from entering hard to reach places. It also makes clean up a breeze! Check out the video below. The Stuff Stopper was designed to be almost invisible, and to keep those hard to reach places clean. The patented design was designed to be able to fit most common appliances. 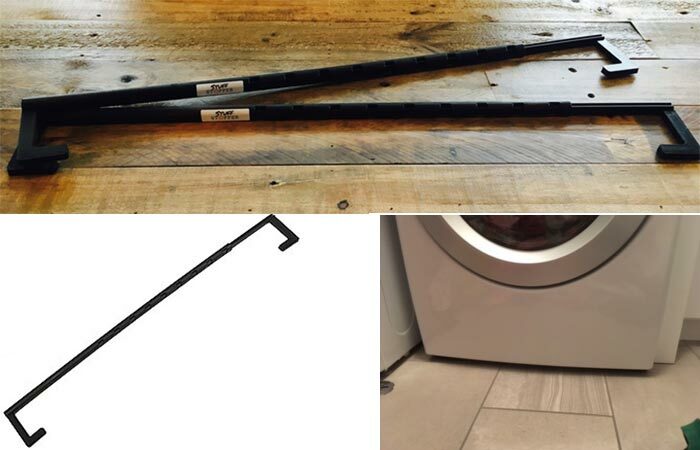 It does this by extending from 23” to 37” and it fits around the feet of your appliance. It was also designed to be pretty much invisible since it sits a few inches back from the front of your appliance.